Raisa Bryan now works for the enrollment office at Southwestern. Raisa Bryan went from knowing her entire public high school campus, to not knowing a single soul at Southwestern Adventist University. 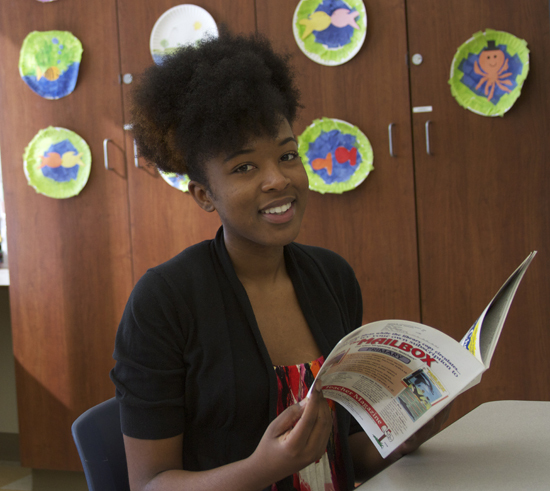 Now she is a junior studying elementary education, and loves her college experience. Bryan had wanted to attend a state college with her friends. Yet her older sister, who is a Southwestern alumnus, along with her mom, encouraged her to come to Southwestern. Hesitant at first, Bryan decided to visit the campus. Bryan got a job working at the café and began to meet people. It did not take long for Bryan to fit right into Southwestern. Coming from a public school, one of the largest differences that Bryan noticed was spirituality. Attending chapel was the weird part for her to get used to. Bryan found that having God become a bigger part of her life has made a definite difference. While attending public school, Christianity was more of a family thing, and at school was not often talked about. Now she really enjoys her Bible classes, and being able to dig into the Bible both for class and for her own understanding. Another part of Southwestern that Bryan enjoys is the variety of people. Living in Cleburne, and being a self-described country girl, Bryan says, “It’s a significant thing to meet someone from the other side of the world.” People attend Southwestern from many places, which make the learning environment very versatile, and bring a wide variety of culture to the school. “If it weren’t for my sister I don’t know if I would have come to Southwestern,” says Bryan. “I really admire her. She finished her bachelors, and her masters, in four years. She made sacrifices, really focused, and that challenges me to apply myself. Bryan also looks up to her teacher Mrs. Cheryl The. Mrs. The is an assistant professor of education at Southwestern, who also taught at Keene Adventist Elementary School. When Bryan graduates, she wants to be a speech pathologist. Her dad went to a school in a British system that was tough on being grammatically correct. As a result of her dad’s schooling, Bryan was taught that good grammar is a vital part of life. She believes that it is very important to be able to speak well, and doesn’t want anyone to be made fun of or judged because of the way they talk. “I’m very happy to be at Southwestern,” says Bryan. “If I would have gone to a state school I don’t know what would have happened. I like to be comfortable, but coming to Southwestern was a good shock. It brought out a lot of my personality.